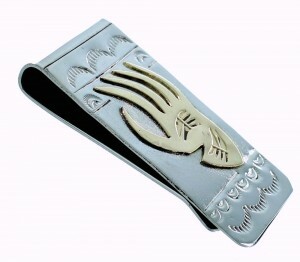 This is a very gorgeous money clip that would make a great gift! This piece of Native American jewelry is Navajo overlay hand crafted by artist Genevieve Jones, out of genuine sterling silver and 12 Karat Gold Filled. Overlay is a process that utilizes at least two layers of sterling silver or gold. One layer forms the foundation, while the second layer is used to design the individual detailed overlay. 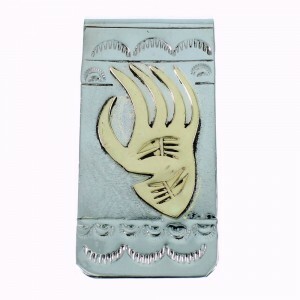 In this money clip the second layer forms a wonderful 12KGF bear paw design. Stamped patterns accent the money clip for a perfect finish. In Native American beliefs, the bear paw is usually considered a way to call for the power of the animal spirit, or as an indication of the presence of the spirit. It is a symbol that represents inner strength. 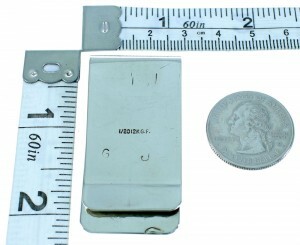 The money clip is stamped 12KGF and hallmarked.